Now That You Mention It by Kristan Higgins is highly recommended escapism with drama, reconnecting with family, facing past and present issues, and a bit of romance. Dr. Nora Stuart is practicing gastroenterology in Boston, but after the incident (the Big Bad Event) that changed her, she feels like she's just surviving. The spark with her boyfriend, Bobby, an ER doctor, seems to be lacking. When she is hit by a van when leaving the hospital and then sees Bobby flirting with another ER doctor while she is lying there, dying, she knows it time to move on. She needs to heal, both mentally and physically, from her accident. Nora decides to go back to the place she couldn't wait to escape from: Scupper Island, Maine. Nora arrives on the ferry with Boomer, the dog of dogs, and her bags and is met by her mother, Sharon. While healing physically from her accident, Nora is hopeful she can finally make some kind of emotional connection with her taciturn mother, Sharon, establish a relationship with her teenage niece, Poe, hopefully reconcile with her sister, Lily (after she gets out of jail for drug dealing), and, maybe, finally find out what happened to her dad when he left them all years ago. Nora originally left the island without looking back. She was an over-weight, unpopular, but overachieving teen who won a full scholarship to Tufts. The town resented her for this, feeling that she stole it from the popular golden boy, Luke. Now there are still some who resent her, some who don't recognize or remember her, and a few who will give her a chance. Now That You Mention It is one of those feel-good novels that sometimes you just need to read for escapism. In this case, though, it's not a simplistic, mindless novel. 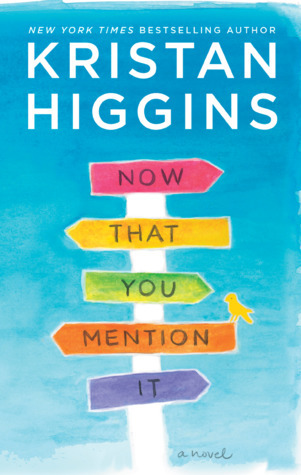 Higgins has it all - complex relationships, a complicated family saga, light romance, humor, and obstacles to overcome. Nora has a complex past and Higgins takes the time to explore it all while current events are equally compelling. The writing is excellent, the characters finely drawn, the drama feels real, and the dialogue is extremely well done. Higgins' creates a likeable, sympathetic character in Nora and supporting characters. Readers will be cheering her on and hoping she finds answers and closure for everything. While the ending ties up all loose ends perfectly, it doesn't arrive without plenty of laughter, struggles, memories, and questions. But, even when tackling serious concerns, this is a novel with a positive, upbeat feeling and an underlying lightness to it. There are several hilarious scenes that you will remember. This would be an excellent stress-reliving choice to read over the upcoming holidays. Disclosure: My review copy was courtesy of Harlequin.